Is President Bush Acting Like A Clumsy Christian In Public? Terry Mattingly at the Get Religion blog is on my wavelength on the Bush's-clumsy-over-Christmas issue (as opposed to my pal Kathryn Lopez, who suggests I shouldn't be spouting silly Bush wimp nonsense.) He says Bush's joke the other day cheekily replacing Jesus with Santa as our Christmas savior is "a sign of how tone deaf the whole Bush clan is about the cultural style and lingo of evangelical Christianity. Watching a TV talking head or reading a article, sometimes one wonders at how much a journalist is willing to sell him/herself. Apparently in the UK, the price is about $59. That may seem an unusual thing to say but this eBay auction for a "used" editorial staff of a southwestern English newspaper is hardly something you see every day. Apparently, the staff of the Western Daily Press is about to be the subject of a downsizing as its parent company prepares to sell the paper and several others. To get around this, the Press's editorial staff is offering interested buyers the "the right to employ every redundant member of staff to produce the newspaper of your choice." "This could be the start of your media empire," the listing reads, later offering a "FREE guarantee of dedication to our prospective new employer" with a promise that the staff is willing to work unpaid overtime hours. 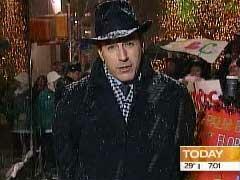 Friday morning, NBC Today show reporter Natalie Morales was covering the snow fall in Central Park. USA Today, NY Times portray a five-year-old glitch as new evidence against company. Syriana: Realism or a Left-Wing Assault on Oil? Media go to the well to promote anti-American movie and warn against perils of capitalism. The Associated Press/Ipsos released results of a new poll concerning the public’s opinion of political corruption. In its report about this survey, the AP categorized the public’s negative view as being almost exclusively a Republican problem. For some reason, New York Times science reporter Andrew Revkin, in Montreal to cover a climate change conference, instead gives prominent coverage to an ongoing rave of young leftwing environmental activists. When you wonder if the national media's biggest film critics rave over movies based on their own personal politics instead of the product they're watching, you can always think of Washington Post film critic Ann Hornaday. The D.C.
How does one analyze the economy's performance without considering tax policy? In a column posted on the afternoon of December 8 at MSNBC's web site, James C. Cooper and Kathleen Madigan of Business Week Online devote over 1,100 words to analyzing and explaining the current strong economy, and fail to cite the 2003 Bush tax cuts as a possible contributing factor. In fact, the words "tax," "Bush," and even "government," do not appear at all! 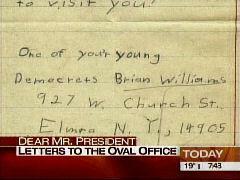 NBC’s Brian Williams: A “Democret” Since He Was 7 Years Old? It’s long been known that NBC Nightly News anchor Brian Williams dropped out of the George Washington University in 1979 to intern in the Carter White House’s correspondence office sorting letters. But in the 7:30 half hour of Thursday’s Today we learned that 13 years earlier, in a 1966 letter to President Lyndon Johnson, he had proclaimed his commitment to the “Democret” party. Al Franken: Duelfer Report Said Iraq's WMD "Were Destroyed by President Clinton"
On the December 7, 2005, broadcast of MSNBC's Scarborough Country, guest Al Franken claimed that Saddam's WMD "were destroyed by President Clinton" in 1998 and asserted that "the Duelfer Report said that very thing." The Truth? The Duelfer Report says no such thing. There's no such basis for Franken's claims. I heard Laura Ingraham notice Thursday that New York Times reporter Sarah Lyall used an L-word in her story on playwright and Nobel Literature Prize winner Harold Pinter's "furious howl of outrage" against America in his Wednesday acceptance remarks. It comes in paragraph five: "The literature prize has in recent years often gone to writers with left-wing ideologies.